Over the last several years, I've been tracing the history of various rpg genres (Post-Apocalyptic, Superhero, Steampunk & Victoriana, Horror). I've hunted down obscure games and tried to traces shifts in game approaches and systems. I'd considered myself fairly well read in the field. Recently, however, I discovered a major gap in my knowledge. Thankfully gaming expert and noted talk show host Dr. Tom the Frog pointed me in the right direction. While speaking with Dr. Tom's Production Assistant at Origins, he mentioned the good doctor's frustration that a whole line of rpg development had been ignored by mainstream writers. Jon Peterson's otherwise excellent Playing at the World exhaustively examined the role-playing's origins, but ignored Amphibian games. Shannon Appelcline's Designera & Dragons shows a distinct "Mammalian" bias. Even MIT's series of collected essays on gaming dismissed these products as "outside their research pool." That's a slippery slope to ignoring all non-human contributions to the field. With this list I hope to correct those glaring omissions and shine a flashlight onto the emerald underbelly of our hobby. Below I've assembled a brief and selected history of these cold-blooded rpgs. 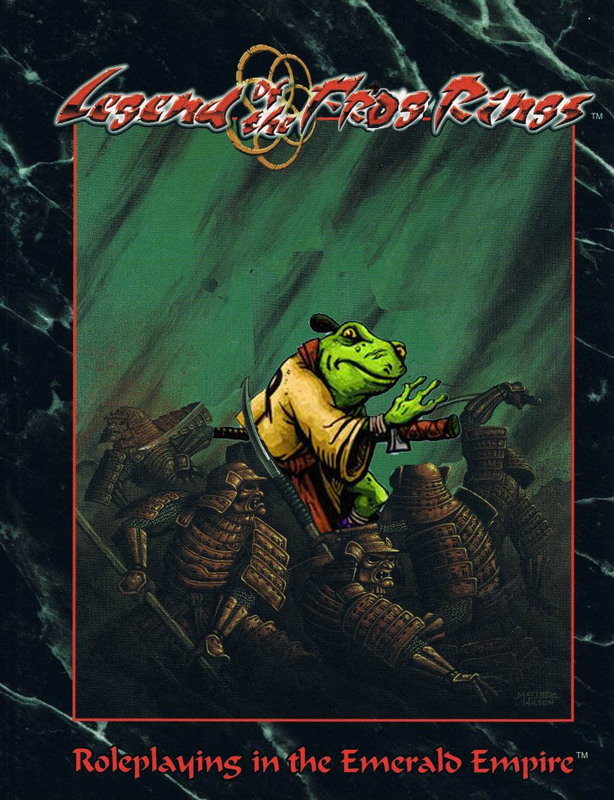 While TSR became known for the strikingly original Dungeons & Dragons, true connoisseurs understand the importance of Flying Bullfrog’s Tunnels & Toads (T&T). The developers had spent years working on wargames adapted from popular novels, in particular Winds & Willows: A Concise Set of Miniatures Rules for Tabletop Play and Conflict. When they saw how D&D overlooked the amphibian market, they sprang into action. T&T has had multiple editions over the years and spawned many fantasy imitators: Polliwogs & Perils (1983), Warthammer Fantasy Roleplay (1986), and Tailslanta (1987). But none have matched the reach of this true original. When T&T took off, Flying Bullfrog looked around to see what other genres they could spread into. Gamma Pond was the earliest and most successful of these game lines, eclipsing Torpor Secret (1980) and Swamp Frontiers (1992). Gamma Pond presented a wasteland devastated by chemical dumping and running amuck with wild mutations. Players could even run intelligent “humans.” Later editions would shift between more gonzo and less gonzo, but none made the splash of this first release. Many consider Gamma Pond the spiritual granddaddy of the popular Apocalypse Pond (2012). 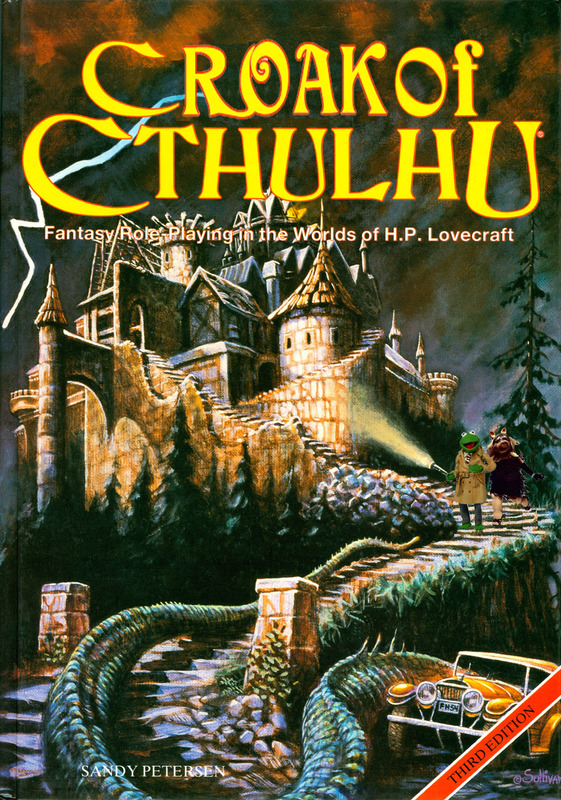 This classic game of Lovecraftian horror draws on the author’s lesser known series of children’s books set in Newt England. CoC set the stage for endless horror games like Gill: The Game of Cold-Blooded Horror (1984). However few have had the longevity of this line. Palladium’s first and last attempt to break into the lucrative amphibian market. However lack of product research led them to focus more on reptiles than frogs. As a result the game did poorly and fell into complete obscurity immediately. Short for “Generic Amphibian Roleplaying System.” It offers the first attempt to capture the biodiversity of different genres and campaign styles. Some love the game for its breadth, others for the crunch it brings to the table. GARPS is noted for the richness its vast array of sourcebooks for genres and licensed properties, useful even to gamers outside the system: GARPS Axolotl, GARPS Frogger, GARPS Chrono Trigger, and GARPS Muppets. 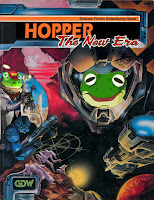 Cyberpunk finally came to amphibian gaming with this release. Players took the role of “Shadowhoppers” carrying out dangerous and shadowy jobs. Characters could chrome themselves up with bionics like Roboflippers and Smart-Tongues. Alternately they could be a sticky-fingered thief or magic-wielding Wartlock. Later the developers would expand the “meta-story” for this setting, connecting it to their fantasy game Swampdawn (1993). The ‘90’s brought with it an over-the-top attitude. And few rpgs are as gonzo or challenging as Battletoads of the 23rd Century. With a combat system combining extreme lethality and low hit probabilities for the players, few GMs managed to run complete campaigns or even full sessions. Still the company did reasonably well for itself when the property was adapted into a video game the following year. Few game lines have been as revolutionary as the World of Croakness. It combined personal horror, romantic story-telling, and a gloomy dank atmosphere. It also introduced the first “Dice Pool” system, which required players to keep their dice moistened. Weretoad the Dampening, Newtling the Dreaming, and Hopper the Reckoning remain true classics today. 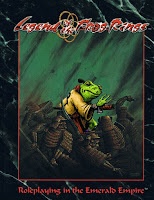 WoC remained at the top of game sales, even in the face of CCGs and CCG-based rpgs like Legend of the Frog Rings (1996) and 7th Swamp (1999). It stayed strong in the face of later unusual horror challengers like Unknown Armies (1998) and All Flies Must Be Eaten! (1999). 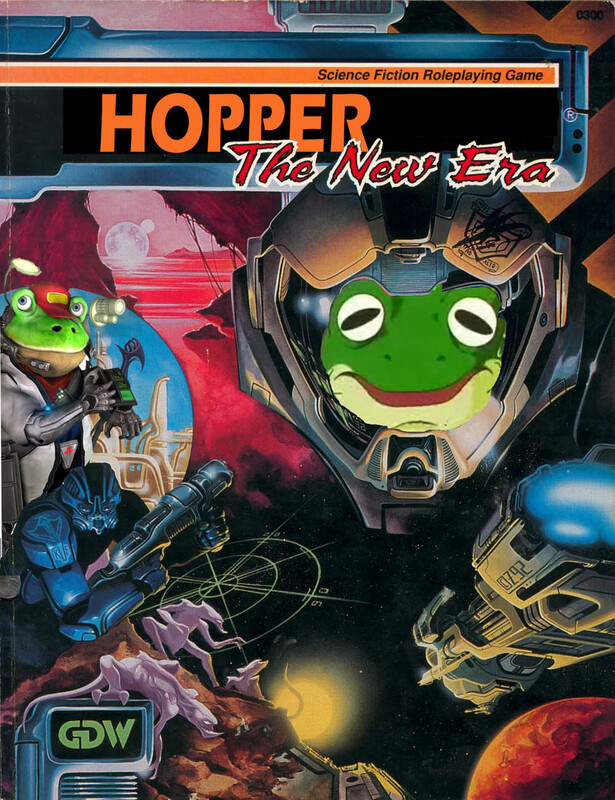 One of the first amphibian games to embrace anime & manga like Keroro Gunso and Neo-Genesis Lillypad. Some of those elements had appeared in the earlier Tadpoles from Outer Space (1987), but BEWM dove in flipper first. The company, however, ended up in bankruptcy, killing this line as well as the revolutionary superhero rpg, Slither Age Sentinels. One of the most important “storytelling” games. It heralded a new revolution in the way players approached play. Most later Indie Amphibian rpgs trace their heritage to this: Slimetime Adventures (2004), Flyasco (2009), Froggymatsu (2012), Questpondia (2015), and even the forthcoming Eject Park, a stealth game by Will Hindmarsh. A game system for simulating hard unboiled detective stories. Appearing first in The Ecoterrorists (2006), it has been popularized in new adaptations such as Tail of Cthulhu (2008) and Newt’s Black Agents (2012). D. Vincent Croaker followed up Frogs in the Vineyard with this striking post-apocalyptic rpg. As opposed to conventional character creation, players select from playbooks describing different roles. Each has a unique set of "Leaps" or actions that character can take. The playbook pool includes many archetypes: The Flycatcher, The Gill-less, The Glad Glander, The Wader, The Hypnotoad, The Hopperator, The Moulter, and more. It anticipates a new resurgence of interest in the post-apocalyptic, like the recent Deranged Dig'em: Fury Creek. A controversial fantasy rpg, many argue it kicked off the modern Repto-Clone game movement. Based on the popular webbed comic. Atomic Ribbit uses Fate (Froggy Amusements Told Ecstatically). The same system powers Bullfrogs! (2012) and the Dresden Flies RPG (2012). You can see my interview with Dr. Tom here.